A group of six afterschool educators come together for a monthly professional development course in which they are learning to facilitate STEM programs effectively. Today’s meeting focuses on how to model science practices. To begin the meeting, the facilitator sets up an icebreaker to allow the other five educators to get to know one another better. The facilitator asks, “What upcoming STEM program are you most excited about?” Sofia, an afterschool educator at a 4-H program, talks about the summer coding club that she is starting; the other participants join in. Scholars in many fields have documented that the sharp population increase among Latinx people in the U.S. has been accompanied by myriad social challenges (Suárez-Orozco & Suárez-Orozco, 2009). Both established populations and new arrivals struggle to obtain quality education, adequate healthcare, and employment that pays a living wage; they also deal with various forms of discrimination. Analyses repeatedly indicate that these and other issues often shape the daily lives and developmental trajectories of Latinx youth. These social issues also undermine Latinx participation in out-of-school time (OST) programs, which hold potential to promote youth well-being (Guzman-Rocha, McLeod, & Bohnert, 2017). Increasingly, leaders of youth-serving organizations voice concern about low Latinx participation (Borden et al., 2006), often recognizing that poor participation reflects a need to develop new capacities and inclusive practices (Perkins et al., 2007). 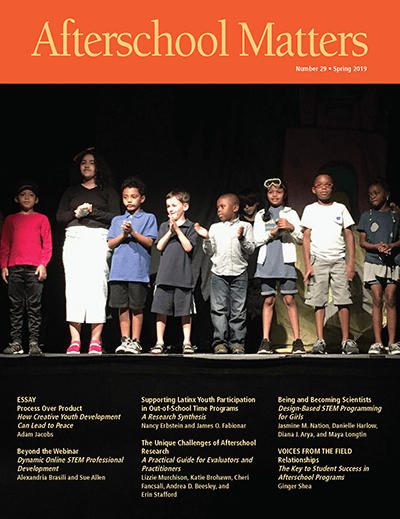 Funders and policymakers are increasingly recognizing the afterschool field for its vital role in supporting the social and emotional growth and academic achievement of school-age youth. Although this recognition is welcome, it often comes with increased expectations for high-quality research demonstrating the value of programming. To satisfy these demands and make the most of funding opportunities, practitioners must develop strong partnerships with external evaluators. However, developing afterschool evaluation partnerships that work well for all parties is often far more difficult than program directors or evaluators anticipate. “I am a scientist. I’m not like a scientist.” We were excited to hear this response from one of the girls who participated in our afterschool program focused on science, technology, engineering, and mathematics (STEM). The STEMinist Program was a research-practice collaboration between university researchers and an afterschool program for female students in grades 4 to 6. This article describes how the program’s ongoing design transformations increased girls’ understanding of and interest in STEM. Design-based framing (Barab & Squire, 2009) enabled ongoing adjustments to the program while also identifying best practices for afterschool STEM learning. To understand the program’s progression and outcomes, we examined the features of the learning environment and the relationships among design components by analyzing qualitative data collected before, during, and after program implementation. Participants’ perceptions of science and scientists helped us understand the impact of the program and ways to improve it. Student success and achievement in afterschool programs depend on caring adults who go above and beyond to make children feel that they are special and can achieve anything (Akhavan, Emery, Shea, & Taha-Resnick, 2017). In the Oxnard (California) School District, where I am the afterschool grant manager, many of the 200 staff in the Oxnard Scholars afterschool program are working in their first job. This is the first time they have been in charge of young people and the first time they have been called “teacher.” These firsts can be drawbacks, but they also can create powerful opportunities to build staff members’ capacity to engage students and enrich their lives.